I love making focaccia – I make it twice (sometimes thrice) a week. So this challenge was a breeze since I had two doughs ready in the refrigerator when the challenge was announced. A big thank you to Rachael of pizzarossa and Sawsan of Chef in Disguise for hosting this month's challenge. A most enjoyable challenge and I stunned at the sheer variety of focaccias made by the other Daring Bakers', the spelt flour focaccia was of note. 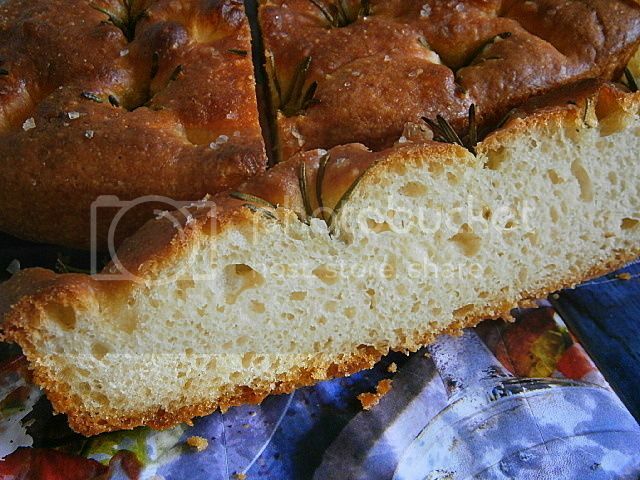 My focaccia recipe uses mashed potato which produces a wondrously soft chewy tender (almost cake-like) moist open crumb with a crisp thin crust and increases the shelf life of the bread. Basically you replace ½ cup of water with ½ cup of mashed potato which produces a softer than normal dough that is slightly tacky which encourages the formation of large holes in the crumb of the bread. Also I like to cold-ferment my dough. That is use ice-cold mashed potato and ice-cold water and rise the dough in the refrigerator (overnight or up to five days) which really produces a very flavoursome bread. Using mashed potato captures a lot of moisture so allows for a higher temperature and longer bake time so the crust can develop a deep brown colour and flavour. I like to really brown (in a very hot 260°C/500°F/gas mark 11 oven) my focaccia since ¾ of the taste of bread comes from the crust. I usually stuff my focaccia with olives, salami sticks and semi-dried tomatoes (or roasted capsicums) and then cut and slice them so I can use them as pizza bases. Using mashed potato and the cold-ferment method produces a thin crisp crust with a crumb (interior) that is soft, tender, moist and airy with large open holes. The slow cold fermentation process gives maximum flavour to the bread and it's still great to eat the next day. The high hydration dough allows a thin crisp deeply coloured and flavoured crust to develop without the bread drying out. 1. The dough is about 90% hydration it is soft, pliable and elastic and slowly flows into the shape of the pizza pan which ensures that the focaccia is level when baked. The dough when cold-fermented has the consistency of "warm melted mozzarella cheese". Every day in the fridge the dough will improve its internal structure (up to five days) to produce a silky smooth well-hydrated gluten network. 2. Resist the temptation to add more flour, the dough should be soft, tacky and loose these characteristics create a crisp crust with an open crumb. The high water content (hydration) of the dough produces a lot of steam when baking so creating a thin crisp crust and large holes within the crumb (interior) of the baked bread. 3. Using milk increases the colour of the crust when baked. 4. Cold-fermentation creates the maximum amount of flavour compounds in the dough. 5. If using rosemary coat it lightly in oil so it will not burn in the very hot oven. 6. Gentle handling of the dough is essential when spreading out the dough in the final rise. 7. If you find your bread is doming too much you can gentle pat (using a clean tea towel) it level ½ way through the baking time. 8. Preheat your oven to maximum for an hour, so the initial blast of heat will really give a huge "oven spring" to the focaccia dough. 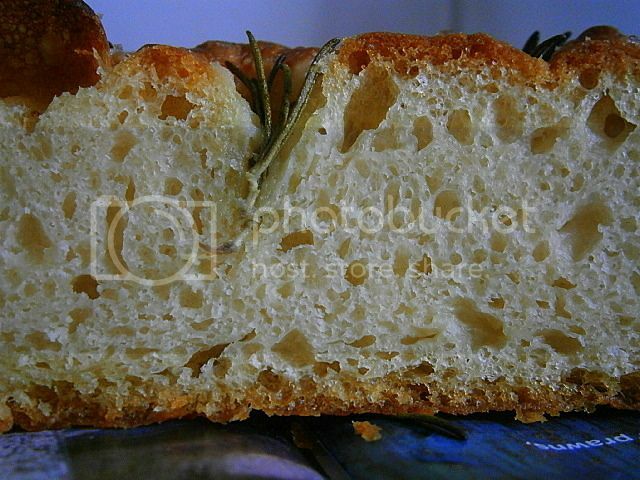 The baked focaccia should have a thin crisp crust with an airy crumb with large holes. 9. Using mashed potato gives the focaccia an extra soft tender crumb and extends its shelf life since the potato "locks" in the water so delays the bread going stale. 10. You can use instant mash potato powder, just make up the required amount then add that to the flour mixture do not add the powder to the flour it will lump-up and these lumps will never go away so you will have to start again. 11. Use the water that the potatoes were cooked in for the water in this recipe to add extra tenderness to the crumb. I usually freeze the water I cook the potatoes in and use that for all my bread doughs it adds a nice touch of tenderness to the crumb. Also yeast just loves potato water it seems to give the yeast beasties extra lifting power. 12. Use the best quality extra virgin olive oil you can afford, it will really add a gourmet taste to your final focaccia. 13. It is important to add a good amount of olive oil to the baking pan before adding the dough for the final rise. The oil soaks into the dough and during the bake it creates a super tasty "fried" base for the focaccia. 14. 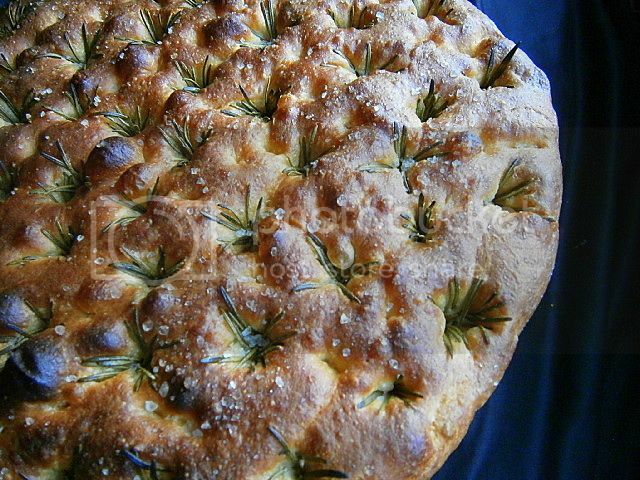 Focaccia is a wonderful treat to bring to BBQs, pot-lucks, parties etc. 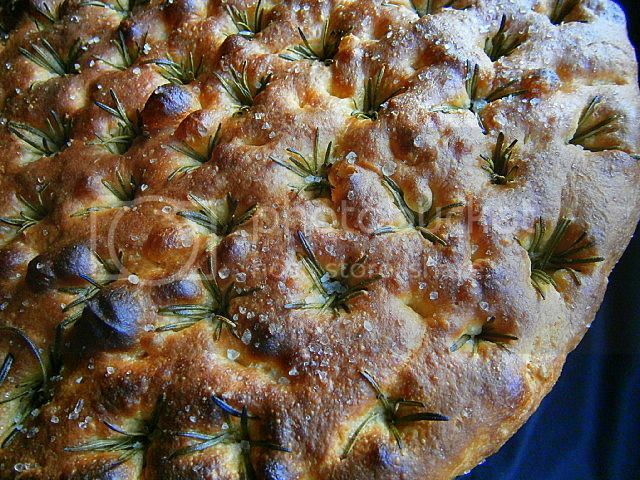 Since you can make the focaccia look authentically rustic or exquisitely elegant by the decorative placement of the toppings into and on the bread. 1. Whisk the flour & dried yeast in a medium bowl. Add the salt whisk until mixed. 2. Add the ¾ cups ice-cold water (or milk), ½ cup ice-cold mashed potato and the ¼ cup of olive oil. 3. Mix with a plastic scrapper or wooden spoon until just combined about a minute, it will look like a shaggy blob of just-mixed flour and water with lumps, just make sure all of the flour is moistened with the liquid. Don't worry the cold ferment process will "knead" the dough for you. 4. Cover the dough and bowl with a thin layer of oil or oil-spray. The dough should be like a shaggy mess. It will be sticky and tacky but over the cold-ferment it will become a smooth elastic soft dough. 5. Cover the bowl in plastic wrap. 6. Place the bowl in the refrigerator's coldest spot overnight or up to five days max. 7. The dough will hydrate and knead itself to a soft elastic slow-flowing dough (like "warm melted mozzarella cheese") during its time in the refrigerator. The dough's structure will get better each day (up to five day max) during this process. Add a couple of tablespoons of cold water if the dough isn't soft enough. 8. Everyday; turn, stir and fold the dough over itself using a scrapper or wooden spoon about 30-60 secs. Re-spray the dough with oil-spray and re-cover the bowl with plastic wrap. Place back into the refrigerator. 9. If making the overnight version; turn, stir and fold the dough over itself, after a few hours of refrigeration to ensure max gluten formation. This step is not necessary if making a multi-day cold-ferment dough. 1. Preheat oven to maximum or to very hot 260°C/500°F/gas mark 11 for one hour. Modern ovens can behave erratically at very high temperatures so go as hot as your oven can handle to establish an even stable temperature most likely 240°C/465°F/gas mark 9. 2. You can use one large deep pan or two medium pans. 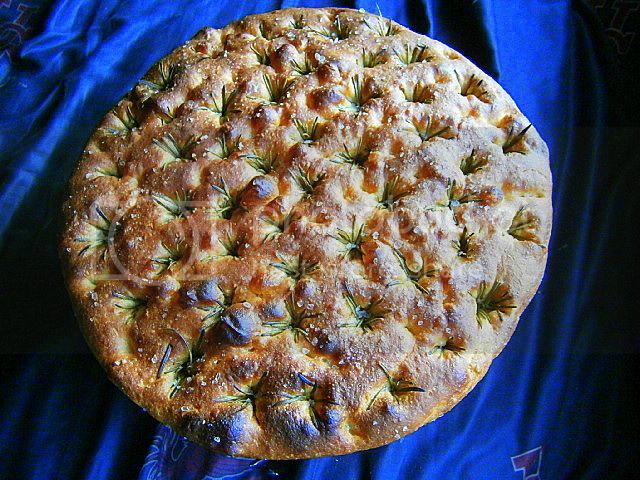 On the day you wish to make your focaccia take out the bowl from the refrigerator. Cover your baking pan(s) with the ¼ cup of olive oil (the oil layer should be at least 3 mm (1/10 inch), a little more is even better) & gently “pour” (without deflating too much) the dough into your pan(s). Gently level the dough in the pan(s) using your finger tips in slow careful movements. If the dough resists let it rest a few minutes and continue levelling until completed. 3. 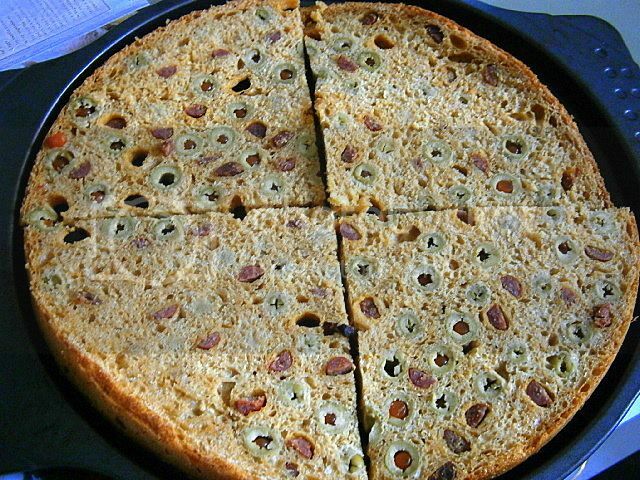 Firmly poke the stuffed olives, salami (or cooked-sausage) into the dough in a decorative pattern. As an option you can poke the capsicum (red bell pepper) pieces into the pattern as well. 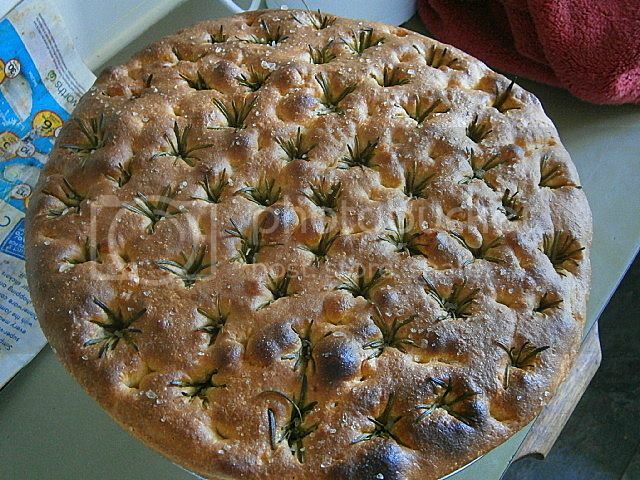 (If making the rosemary/sea salt version firmly poke the lightly-oiled rosemary sprigs into the dough in a decorative pattern try to make the sprigs look like open-flowers). Cover with oil-sprayed plastic wrap. 4. Let rise in a warm draft-free place until doubled (about one to two hours could be longer) in volume. 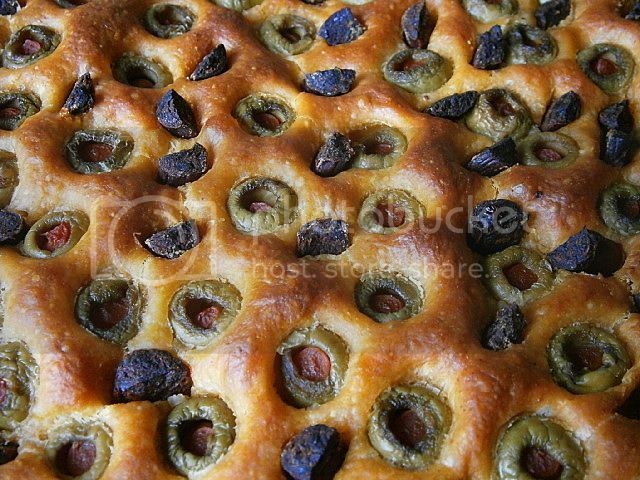 The risen dough should almost cover the olives and salami pieces (or rosemary sprigs) just leaving a dimple of olive or salami (or rosemary) showing. You can poke down the olives and salami pieces (and the optional capsicum pieces) (or rosemary sprigs) if they are poking out of the dough too much. 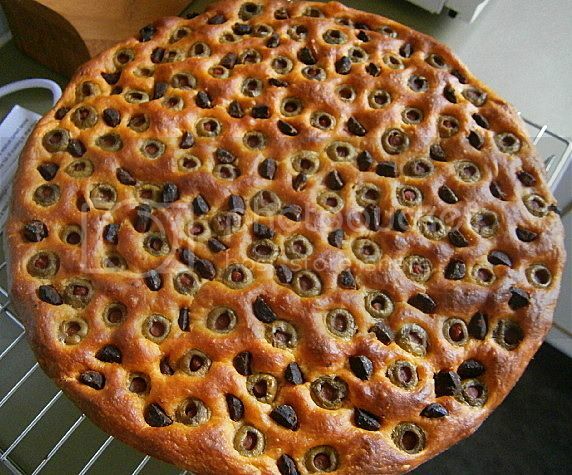 If you wish you can dimple the dough between the olives and salami (or rosemary sprigs). 6. Bake in a preheated very hot oven for 35-40 mins for the large focaccia and about 20-25 mins for the two medium focaccia, rotate the pans half way, and cover with foil if over-browning (or reduce oven temperature 20°C/40°F half-way through bake). If baking this recipe for the first time watch carefully since very hot ovens can behave erratically check how the focaccias are baking half-way through and adjust temperature or cover with foil. The crust should be well-browned almost blackened in a couple of small places and the sides of focaccia will have shrunk away from the pan. The base should sound hollow when tapped. Using a high hydration dough allows for a crisp deeply coloured crust to develop with a fully developed taste and a moist chewy open crumb interior. I usually make pizza with my stuffed focaccia. 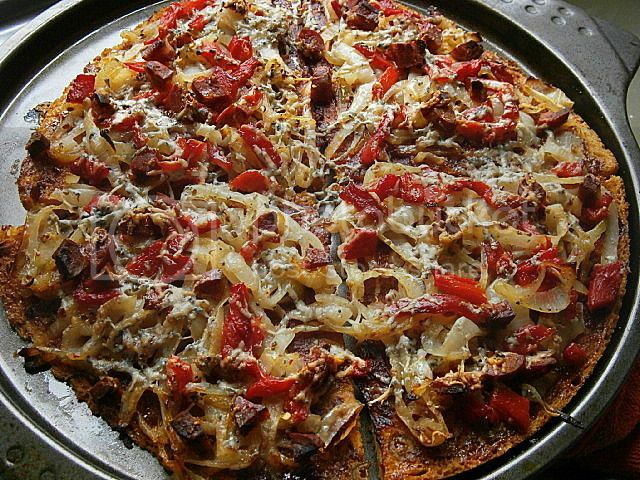 I slice the focaccia into two pizza bases then top with fried tomato paste, well-fried onions, blue cheese, some sun-dried tomatoes and extra spicy sausage and bake in a moderate oven for 15 minutes. The cooked pizza stays crisp the next day if wrapped in foil and plastic wrap and stored in the fridge. 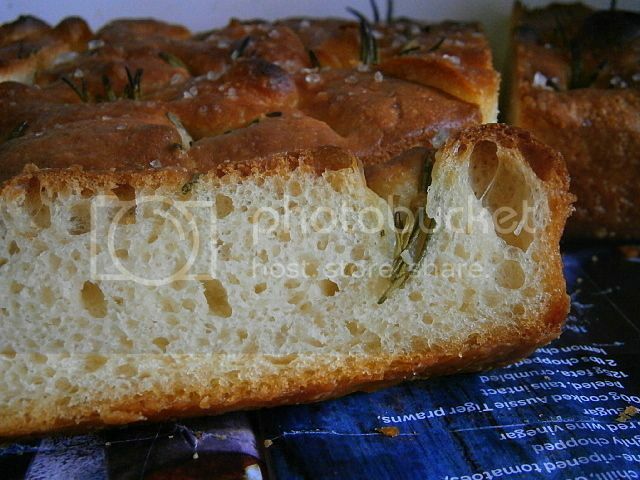 Rosemary and sea salt focaccia I love the look of this rustic looking bread. 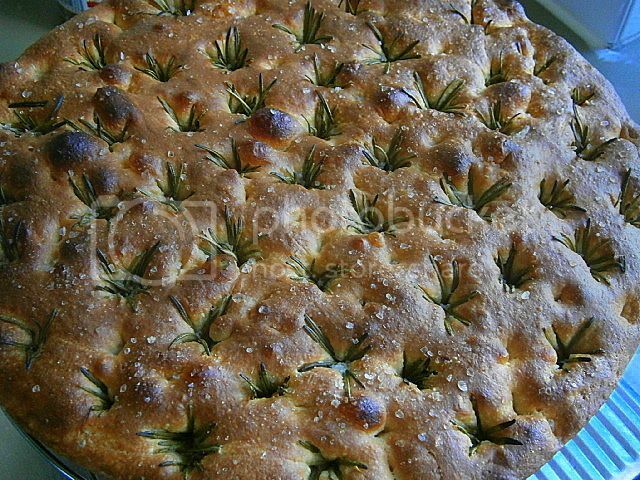 I always try to use whole sprigs of rosemary and poke them into the dough to look like open-flowers which really adds to the to the appearance of the final bread. Remember to oil the rosemary so it doesn't burn in the very hot oven. I will be bringing this to the Royal Easter Show tomorrow we are having a picnic there. oh my! i saw your pictures in the forum, and oh boy i was waiting for this recipe!!!! next time i would try yours! yummy! Hi! I'm visiting from the Daring Bakers, and I just had to stop by. You did a beautiful job! I love the mashed potato idea. I'm going to have to try this. Thank you! Nice to have you back with the Daring Bakers Audax - missed your thorough posts and abundance of tips! Your focaccia looks absolutely wonderful - I'm a big fan of the cold ferment method for bread in general. super Audax.....am seeing your blog after loving your post on daring bakers !